This therapy incorporates the use of both Sounding Bowl and voice soundwork. Sounding bowls are unique in the history of world instruments, partly because their strings run within the resonant space, whereas other instruments have them running above it . A number of types of sounding bowls are in use in therapeutic settings, and used by health professionals and music therapists. The aesthetic qualities, as well as the pure beauty of the sound when played, have lead to deeper levels of emotional engagement, enhancing therapeutic well-being. Over the years, Faith’s work with these unique instruments have brought her insight into how the pure, gentle, subtle tones of the sounding bowls seem to touch the deepest places in the heart and soul. These beautiful sounds seem to form a link between the inner life of the individual and the source of all being. On first seeing the instrument, clients are struck with wonder and anticipation. This receptiveness is instrumental in facilitating the opportunity for healing on many levels, both emotionally and physically. "I felt a gentleness surround me on a soul level". "The compositions have brought a feeling of being cocooned and energised by the deep sense of unconditional love that surrounded me". Sound Healing Therapies shared a post. People using Sounding Bowls are very individual. NHS therapists, University Doctors, pioneers of sound therapy, healers and many others. One such remarkable and unusual individual is Faith Challinor-Wheatley who lives amongst trees and finds their energies strongly in the Sounding Bowls. Faith spends much of each day caring for her mother whose survival of cancer in great old age must be in part to the endless sound therapies she gets from her daughter. 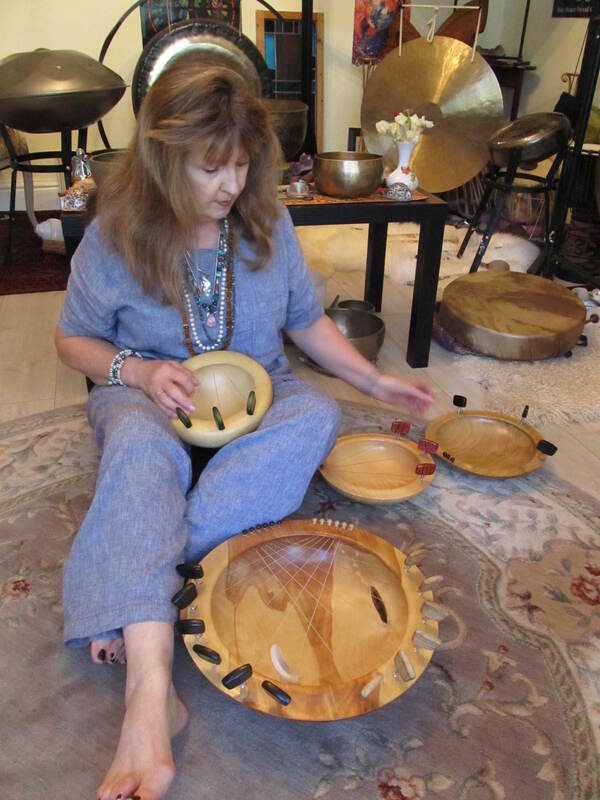 Faith offers a range of healing sounds to a diverse set of clients but is focussing more and more on the Sounding Bowls since she is getting such strong results with them. Many of Faith's clients are finding strength to manage their lives and even turn them around with Faith's work. Sounding Bowls are a unique and modern instrument used in hospices and healing centres across the world. This therapy assists you to connect with your inner wisdom and intuition and assists energy balancing , stress reduction and deep meditation. ***The Sounding Bowl Therapy programme I've developed , enables the client themselves to also choose, engage and play on one of the various sounding bowls available as part of the set programme. Allowing for the individual to sense and feel the healing vibrations of the chosen tree which the sounding bowl is made of. I can highly recommend this therapy particularly if you were feeling anxious or had difficulty relaxing.The sessions helped me gain clarity of thought which has been a great help. The Sounding Bowl treatment had me resting better and feeling more grounded, calm and optimistic and it was like having a clearing of the mind.I think it helped with my energy levels too . Overall, I have slept better since the last session ,my anxiety is low and my ankle has been settled.I haven't experienced any pain in my legs at night for the last couple of weeks. After consultation, and when the client is seated, the treatment begins with a period of silence to allow a peaceful atmosphere in which the client can then engage with the sound vibrations that follow. These are emitted by both sounding bowl and intuitive healing sounds offered by the sound healer. The effects induce a feeling of being immersed in what can be described as a spiral of heightened consciousness, and an opening up to new levels of inner awareness. This therapy has been shown to prove beneficial in helping bring clearer thinking and improved cognitive function, helping to give insight and understanding to clients in their day- to- day life and circumstances, whilst also helping tune and energise the subtle energy centres ( chakras ) and helping both emotional and physical conditions. Click to view clients’ comments ( middle section). Treatment lasts approximately one and half hours with time for client rest and ground.